I am in love with Mercedes Benz. There, I said it again...the only love in my life at this time... "She" is fast and furious ... The newly developed V8 supercharged engine delivers an output of 460 kW/626 hp and accelerates the sports car from 0 to 100 km/h in 3.8 seconds. 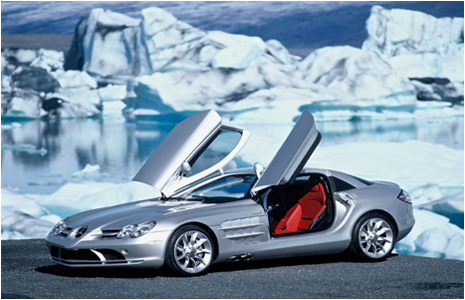 The new Mercedes Benz SLR McLaren is an impressive testament to the competence and experience of Mercedes Benz and their partners at McLaren ... BRAVO Mercedes Benz!